My beautiful serenity, at a lower cost. I love this book. It heals me just to look at it. Bring me peace. I hope it brings you peace too. And it's available here at lulu.com at a lower cost than at Amazon. Buy it for someone you love. Someone who needs it. The complete text of the original Serenity Prayer in large, simple coloring font with 14 mandala coloring images for peace, meditation and healing. Exact text within: God grant me the serenity, To accept the things I cannot change; Courage to change the things I can; And wisdom to know the difference. Living one day at a time; Enjoying one moment at a time; Accepting hardships as the pathway to peace; Taking, as He did, this sinful world, As it is, not as I would have it; Trusting that He will make all things right, If I surrender to His Will; So that I may be reasonably happy in this life, And supremely happy with Him, Forever and ever in the next. Amen. The Serenity Prayer is the all-encompassing and time-honored healing statement of acceptance, courage and wisdom. 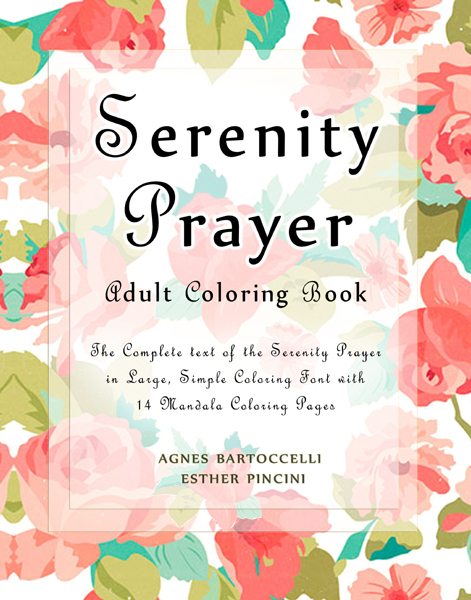 Color in the complete text of the Serenity Prayer presented in large, simple coloring font with 14 mandala coloring pages for peace, meditation and spiritual healing.